91 pages elaborating on everything that accounts for the Ferrari Myth supported by absolutely stunning photography. Ferrari 512TR. Extra power and torque for enhanced performance. New engine electronics. Styling refinements. Gestione Sportiva. A year's activity. Enzo Ferrari. Sergio Zavoli, writer, reporter and anchorman remembers a meeting. Engine Designer. Angiolino Marchetti interviewed by reporter Gian Paolo Ormezzano. Mugello. A futuristic plant in a delightful setting. The new windtunnel with climate control. Ferrari and the Carrera Panamericana. Great vintage photography. Happy Birthday! Luigi Chinetti's 90th birthday celebrated in Maranello. 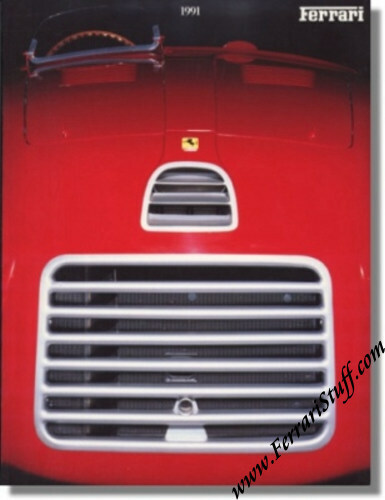 Ferrari Print Number 696/91 I 5M-12/91, issued in 1991, printed in December 1991.